Not easy. I am a nurse and was not at all afraid of Lilly’s feeding tube. But, we eventually felt that she no longer needed it and, most importantly, that she would do better without it. Changing the bandages became harder and harder. Her gag reflex became more pronounced… The worst part was seeing that Lilly genuinely had the desire to eat something but something stronger than she was kept her from doing so. The morning on which I could finally pull the feeding tube out of Lilly’s nose. But also being able to trust that Lilly could eat and drink in various places and in different positions, even while lying down when she played. An end to the nightly enteral feedings and, consequently, calmer evenings and nights. An end to the difficulties in the parent-child relationship after bandage changes and tube attachment or placment (I always felt that Lilly resented me for this) or when we had to prevent her from pulling on the tube. No more fear that an eating disorder might develop or worsen from always sensing the tube in this part of her body. A calm mealtime, a great confidence in our child, that makes us very proud. Many meals together, days shared with the family or with the Au Pair, who cares for Lilly when we are working. Also the good fortune to have been able to visit Lilly’s great-grandfather for the weekend. And, soon to be planned vacations!! 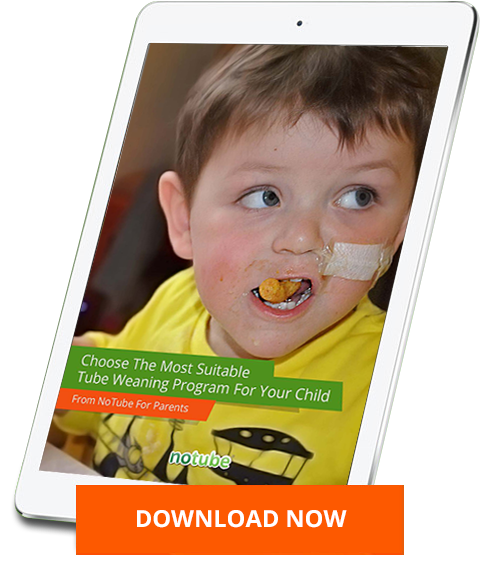 Tube Weaning is the process of stopping any tube feeding and for the child to sustain itself orally!